What if your child was given the diagnosis of a chronic life-shortening disease that meant that, for life, you would be chained to an inefficient, expensive, paternalistic health care system and required an extensive daily health regime prescribed by primarily by clinicians, insurance companies, bureaucrats and researchers - and that you, as the patient/caregiver, were to have no voice or choice in your care? What if your child was given the diagnosis for a chronic life-shortening disease that, for life, you would be a part of a seamless transparent collaborative individualized system built on trust between the clinicians, insurance companies, researchers and other patients/caregivers that focused not just on improving health but focused on whole person's well-being and quality of life - and that you, as the patient/caregiver, would be the primary decision-maker of your child's care? Making the later happen is why I was in Bethesda, Maryland a few weeks ago. I was among 40 experts from a variety of backgrounds from all over the United States and beyond who were asked to come to a two-day meeting at the offices of the Cystic Fibrosis Foundation to help recreate a new Cystic Fibrosis health care model. It will be hard for me to articulate fully in this one post about what went on during this meeting so I will make several posts about it. But I can say, the CF Care Model Design Meeting didn't just inspire me, it transformed me. I am already an engaged patient/caregiver in Bennett's care. I work to be informed. I fight to have a voice. I help make decisions. I try to work collaboratively with Bennett's doctors. But the system is very broken and despite my best efforts, I often feel helpless. I struggle to get the data I need to make decisions for our family and my child. Much of my day is spent waiting for doctors to call me back, renewing prescriptions at the pharmacy, traveling great distances to attend lengthy doctors appointments and doing Bennett's medical care at home. In another post, I will share more specifics about the meeting, how it came about and what we did while we were there. But, I want to use this post to just share some of the ideas that we talked about. I realize that most of these statements aren't going to make sense to those who have never felt trapped in the health care system. The average person, the relatively healthy patient, isn't likely going to fully understand the stress of being stuck in the system or being overwhelmed by day-after-day management of a chronic illness. But, my hope for those CF patients/caregivers or for anyone with a chronic disease (Crohn's, Cancer, Diabetes, etc.) stuck inside this broken health care system is that these statements will be helpful in changing the way we think about the future of our care. What if an ideal clinic visit was one that happened at home? What if we could have our CF visit summary emailed to us? What if we shift our understanding of who is the expert from the doctor/care provider to the person with the disease? What if care providers stopped doing stuff FOR us and started doing stuff WITH us? What if we never had to fit Cystic Fibrosis treatments in, if treatments no longer became a barrier to other parts of life? 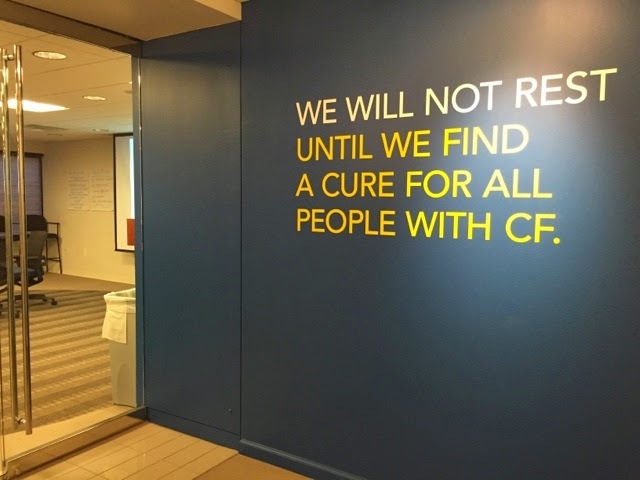 What if there were no more CF waiting rooms? What if exam rooms at clinics were more like living rooms? What if we saw patients as having the right to learn, to access their health information? What if we saw our CF community as being much bigger than patients, parents and providers? What if - home care, school care, the drug store, the clinic - all systems could fit together to support people with CF? What if we had need-based personalization of one's CF health care plan? What if we had individualized collaborative care, not cookie cutter collaborative care? What if we were proactive, not reactive - how might we build such a system? What if appointments weren't so long - for example, what if I didn't have to see the social worker every clinic visit if nothing is going on? What if the patient/parent was the quarterback of their health/life and the care team was the support? What if teachers, parents, pharmacists, clinicians were all part of one whole system of care for one child? What if we adopted the approach: the patient is always right!? What if everyone had access to CF families like them? What if we eliminated the "no news is good news" way our clinics communicate with us? Patients want to hear the good news too! What if we had a CF care "Angie's List"? What if you could rate your CF doctor, Respiratory Therapist, Dietician, Pharmacy, Hospital, etc.? What if labs could be completed before clinic visits so the actual clinic visit could be used for discussion of results? What if CF care centers were publicly graded on their patients' awareness of CF support services? What if you had access to your own personal cystic fibrosis health research scientist? What if every patient automatically received a regular report of relevant clinical trials? What if I could follow the drugs currently being trialed that would help me - an individualized CF drug pipeline? What if we knew how other centers were doing, so we can compare results and learn from each other? What if we had more discussion (virtually) with our care team on a regular basis, not just 4x/year in person? What if we had shorter visits focused on individual patient needs rather than repetitive questioning? What if care focused on how to use our treatment time most efficiently, not just more? What if I (the patient) didn't need permission to make my own decisions? What if I had access to my own data AND aggregated data in (close to) real time via the patient registry? What if data and information was actionable, in the moment and meaningful for everyone involved in my care decisions? What if patient-reported outcome discussions gave us a chance to align what success looks like and spot early sickness? What if we shared the data that we as patients already track? How can we automate tools on behalf of the patients? What if doctors and scientists told us what they were working on and invited us to join them? What if we had more transparency and consistency for trust and confidence in the CF clinician and CF patient relationship? What if research focused on reducing the tremendous treatment burden in cystic fibrosis? What if we included patients in setting the research agenda - a huge opportunity for learning and impact? What if we had access to transparent personal and systemic data with crowd-source validation? We live, breathe and track our illness every second with every breath we take. What if our voices were valued as patient scientists? What if we didn't feel the need to lie - what if we trusted our clinicians enough to tell the truth about treatment adherence? What if we had an easier way to track data so that it's available for decision making? What if we had transparent shared-governance at the CF Foundation level? What if we had a system that was more flexible? Having CF means you have a ton of burden. People with CF aren't just their disease. All of those at the meeting, and many more, are on Twitter listening to new ideas. Log on to Twitter and use the hashtag #CFBigIdea to share which of these statements you agree with most - or maybe come up with your own "whatif" statement. You can also use #whatifhc when you post. My Twitter handle is @breckgamel. I hope others will join us in a revolution to the status quo in CF Health care. More posts to come as we develop something new, different and better!